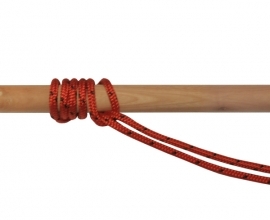 The Spanish Bowline contains two adjustable loops, joined by the same rope. 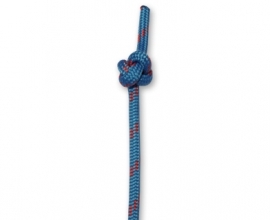 It was originally used as a rescue knot, where the person being rescued would hold on to the loops while the rescuer would pull on the two standing parts. 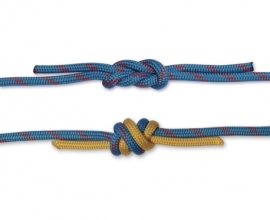 The Spanish Bowline could be used for various purposes as long as the load on the loops is equal to avoid slipping. Considering the loops are directly connected to each other, you can adjust the loop sizes before putting them under pressure. 1. Create two crossing turns, with the standing ends lay underneath the crossing part. 2. Twist the left loop once, counter clockwise. Twist the right loop once, clockwise. 3. Tuck the right loop through the left loop, front to back. 4. Reach with your hands through the front of each loop. Take the left side of the bottom crossing turn in the left hand and the right side of the bottom crossing turn in the right hand. Pull the two side of the bottom crossing turn through the loop that hand is reaching through. 5. 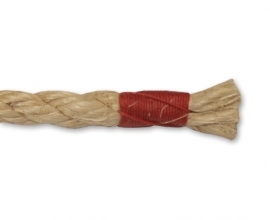 Dress the knot by pulling the loops and standing ends in opposite directions.